Are aliens really slimy? You'll find out by making your own, a species called Snotty. 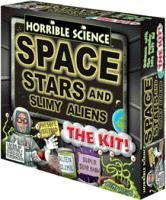 And that's just one of the amazing space experiments in the Space, Stars, and Slimy Aliens kit; try all of them and you might end up doing the moonwalk. But don't take our word for it - have your own close encounter. This kit is cool enough that wars have been fought over it - wars so huge and all-encompassing, some have even called them star wars. Continue your space journey with Spooky Stars, another Horrible Science Kit!